Fire safety is a serious matter and a fire safety inspection needs to be performed each year to ensure that the building is up to code and that all of the fire safety measures are fully operational and not expired or damaged. If there are any problems, a fire safety inspector will give you a report in which you will find a list of things you need to fix in order to pass the repeat inspection. However, you will have to pay for both of these inspections, as well as for the repairs. That’s why experts at Red Truck Fire & Safety Co. devised a list of things to pay attention to before you invite an inspector and ensure that you pass the inspection in one take. When the inspector comes, they will want to see all of your fire safety documentation from previous years, as well as any modifications and improvements you made since the last inspection. If your paperwork is scattered around, or even worse, missing, this might negatively reflect on the outcome of the report or at least make it a lot longer and more difficult for the inspector. 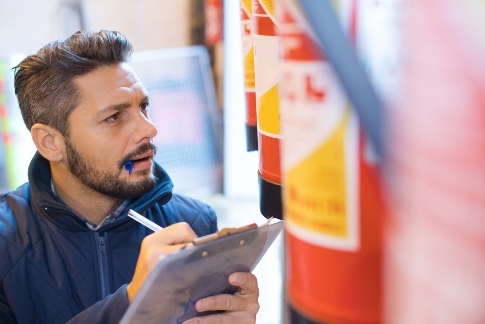 Apart from the detailed and organized paperwork, the inspector will need unobstructed access to all of your fire safety measures and devices. If there is anything that is locked, make sure that you have the key with you and that you provide the key to the inspector. There are numerous companies which manufacture fire safety measures, including fire alarms, sprinkler systems, and fire extinguishers. That means that your fire safety inspector won’t necessarily know everything about the specific make and model that you have. That’s why it is helpful if you know a few things about your fire safety equipment and keep the original paperwork provided by the manufacturer and the installer of the equipment. All buildings need to have a fire evacuation plan clearly visible and displayed so that everyone can see it and get familiarized with it. If the fire inspector comes over, and you don’t have it, that is an automatic fail, which means that you will have to ask for another inspection very soon, all because of a single piece of paper. If you don’t have a fire safety plan, please consult fire safety experts to help you come up with one which will be suitable for your building and your needs. The fire safety inspection is a complicated process, and you need to make sure that your building is up to code in all aspects. Here are some reasons why people fail most often. If you have any of these problems, make sure you fix them before the inspection. It is a lot cheaper and will make it easier to pass the inspection. However, the most important thing is that you will have a building which is up to code and which will ensure that you have the best chances of preventing fires, and fighting them if they do ever occur.